Today is my blogiversary! Bunkycooks has made it one year and what a year it has been! If you write a blog, you might remember how bizarre that first post is when you write something for possibly no one! You keep writing and hope that somehow…someway…someone will find you and read what you have to say! But, before long, many of you came calling and kept coming back for more! I want to thank everyone that reads Bunkycooks. If it weren’t for all of you, I might have gotten pretty frustrated talking to myself for this amount of time, so thank you for reading, preparing my recipes and commenting. For me, the highlights of this year have included hosting Food Blog Forum Atlanta in September. Food Blog Forum was the first ever food blogger’s conference in the Southeast and I am excited that I was able to bring that to Atlanta with the help of Jaden Hair (Steamy Kitchen), Diane Cu and Todd Porter (White on Rice Couple). I also met so many wonderful bloggers that came from all over the U.S. to attend! Thank you to everyone and to all of the great sponsors for your incredible support that made the event such a huge success! Mr. Bunkycooks and I also attended Camp Blogaway in Southern California this past May. Other than a little altitude sickness (at 7,000 feet! ), we had a really great camper experience and enjoyed meeting so many bloggers, mostly from the West Coast. Several of them have become close friends and I look forward to staying in touch on a regular basis. The Bunkycooks have really enjoyed our On the Road with Bunkycooks trips to farms and local businesses and the interviews with Great American Chefs series. We have met some delightful people along the way and have become friends with many of them, too. These are some of my favorite posts to write as there is always a story behind the food and I love to share the personal side of the people we have met. The more challenging part of being a food blogger (as I have learned over the past year) is how to balance your real life and manage your blog. I have spoken to several bloggers about this topic in depth and this is obviously a challenge for many people. I have been through periods where I spent most of my days and nights on the computer between Twitter, Facebook, Foodbuzz and other social networking sites. I have spent countless hours reading other blogs and leaving comments. When you add that time to the amount of hours I spend with recipe development, cooking, traveling, researching, writing posts and managing pictures, I have little time left for myself! I realized at one point at the end of the Summer, that I had literally missed much of the Spring and Summer and gorgeous outdoor weather. I had been on the computer so much between projects (like Food Blog Forum Atlanta), Bunkycooks site development, general blogging related activities and networking that I had essentially missed a few seasons of my life! That time is too precious to me at this point in my life, so it’s time to be more thoughtful about how the time is spent! I have also gained some weight and have been far less active. Of course, sometimes the housework has suffered and even cooking dinners is a challenge (hard to believe that from a food blogger, huh?). We have eaten way too late and have too many cold dinners due to picture taking. Mr. B deserves better care than that, doesn’t he? So, in going forward in the next year, I have made some decisions. I am going to go back to the reasons that I started the blog in the first place – my love for food, travel, writing, wine, cooking and entertaining! I want to enjoy doing what I love to do, but I want to have a life away from the computer, too. When I spend days out of the house and see friends or shop or just do other things…I remember how much I have missed of “real life”. I do adore all of my “Tweeps” and online friends! I have found a community of people who are as passionate about food as I am and it has been a wonderful experience and I look forward to our continued friendship. I do hope I get to meet many more of you in person. I think I will have a few of these to celebrate! However, as much as I love my fellow foodie bloggers, I sometimes feel like we live in an insular environment. We write and comment for each other. So much time is spent supporting each other that it makes me wonder how many non-bloggers are out there reading our blogs. The key for me is reaching beyond the blogging community. That is where the greatest satisfaction lies in knowing that everyday people are actually reading my articles, preparing my recipes and truly enjoying Bunkycooks. 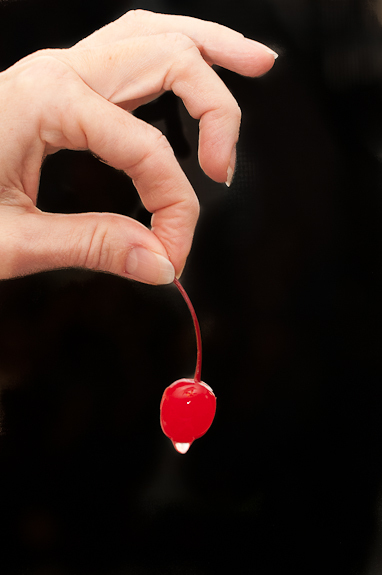 One of the other “interesting” aspects of food blogging is getting your photographs on some of the food photography sites like Tastespotting and Foodgawker. It is always a great day when your photos are accepted, however, the frustration comes when you know you have a great photograph and yet, it is rejected for some reason that seems wrong (Dull/Unsharp, Lighting, Composition)…we have all heard this before (if you are a food blogger). A picture that is tack sharp with perfect white balance is rejected…huh? Then, when you see some of the photos that have been accepted, it doesn’t make any sense! I have learned over the past year to not let it ruin my day, but it certainly can be a frustrating experience. I think that there has to be more balance in the blogging world. It can easily take over your life and at what cost? Could this be a Tastespotting moment? I am going into the second year with a renewed sense of purpose for the blog! I am planning a few projects on the side that I look forward to working on. I am especially excited to get back to cooking again as I begin the recovery from my surgery. There will also be more exciting road trips (in that darn RV! ), interviews and recipes that I look forward to sharing with you. If you don’t see me on the computer as much (Facebook, Twitter, comments, etc. ), it is because I am in the kitchen cooking up something wonderful, shopping (hopefully for shoes soon after my surgery! ), taking a road trip or just outside enjoying the day! I hope you will take time to do the same! 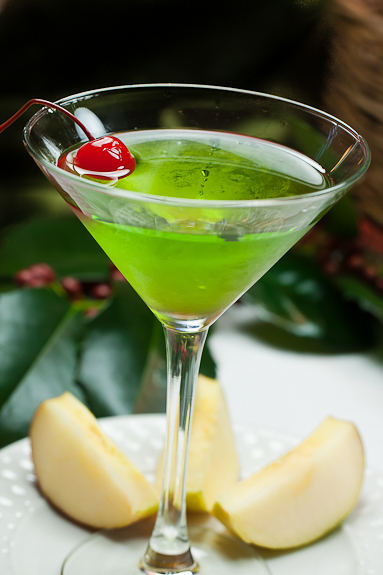 So in honor of today’s anniversary, here is one of the classic holiday cocktails…a Green Appletini! I made these instead of a cake. I had enough of the cake baking stuff when I made my Cat in the Hat Cake for my birthday! 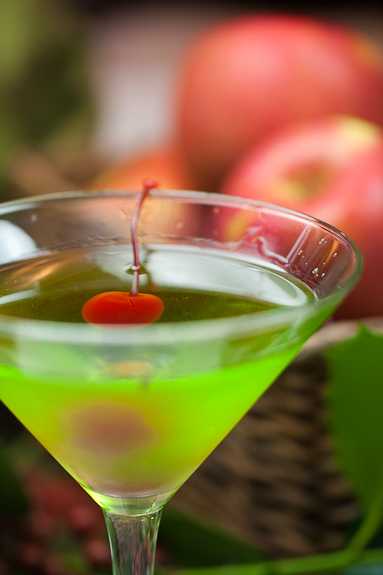 With the holiday season upon us, these will be perfect to share with friends or just shake one up for yourself if you are in the mood for a nice, bright green cocktail! 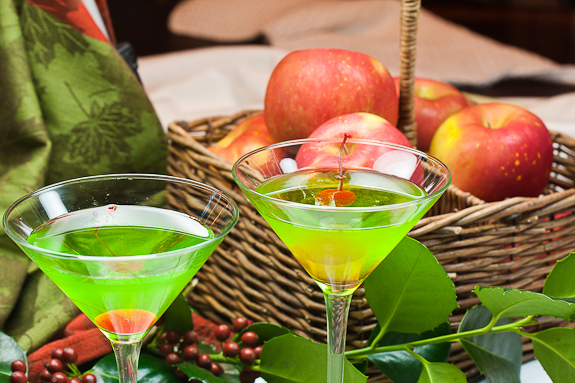 Boozy drinks always liven up a party or celebration. That is definitely one thing you can count on…Bunkycooks will never change that philosophy!! These are perfect to serve during the holidays! Mix all of the ingredients together in a small glass pitcher and chill until very cold. Shake in a cocktail shaker partially filled with ice for just a few seconds. 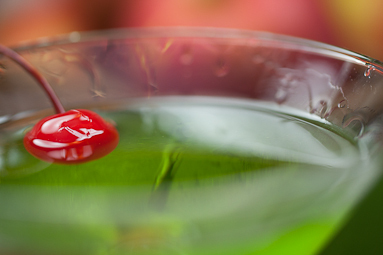 Pour into chilled cocktail or martini glasses and serve garnished with either a maraschino cherry or a green apple slice.